Alright, start off with your basic foundation. 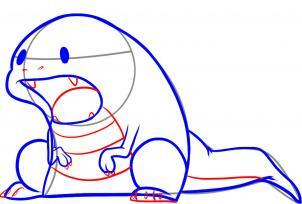 This means by having a simplified skeleton of the dino, you'll have a more easier approach on drawing it! Here I layout a few noticeable shapes that will aid you into drawing the creature. By starting off with the bulk, you'll have a better chance drawing the whole in a desirable appearance! I recommend using a ruler and compass to strike accuracy with the shapes. Next, we draw the basic framing outline of the body. 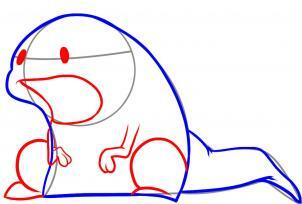 This must be handled first before you draw the other essential parts of the dino. 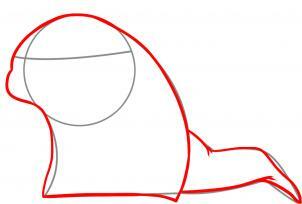 Start off by drawing the head, and work your way down to the lower - rectangular body. From thereon, work on getting that tail in shape. Things will get much easier from hereon! Then, here comes the easy and fun part! You'll have to draw two little dibs for eyes and a large gaping mouth! I love the mouth, it gives the total cuteness a boost! 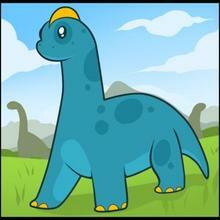 This dinosaur is some type of mix of a T-Rex and Brontosaurus. Swiftly draw mounds of legs and work your way to the arms. This way, you'll draw the arms in place more accurately! Next, work on other features to your dinosaur! By eliminating a blob of nothing, you'll approach a more cute creature! 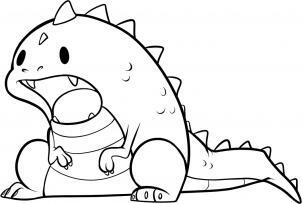 Draw the underbelly scales and feet. Most importantly, to make things super cute and harmless, add a few teeth. Don't fill in the mouth too much with teeth, otherwise you'll lose the point of the drawing; which is cute! Remember, we are not trying to add so much detail, but lessen the detail so it's simple and easy to draw! 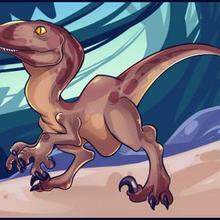 Lastly, here you can open your mind to ways to customize your cute dinosaur! You can add an ongoing spine for your dino (like that of a Spinosaurus), or add separating spikes to the back! 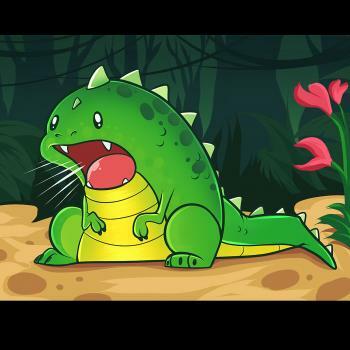 Maybe a few scales would make him look much cuter and definite that it's indeed a prehistoric reptile. Ah, here we have the finished and polished product of the drawing! 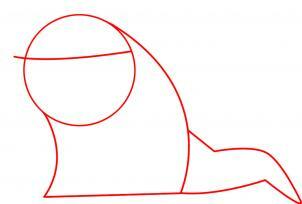 You can go ahead and erase all the useless lines like the guidelines and starting inking out your drawing! This would be a great lesson for creating a dinosaur for your projects! I hope you folks enjoyed this lesson, thanks so much for viewing everyone!